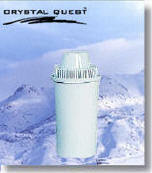 Click Here to order "Corrected Water" re-mineralizing alkalizer. The water delivered by most cities is often acidic from the chlorine and other chemicals added at the treatment plant. Water that is too acidic is not healthy for biological systems. A major problem with reverse osmosis has been the removal of valuable minerals along with the contaminants. Most of these minerals are alkalizing. The resultant water is usually more acidic than the source water. A Corrected Water cartridge will re-mineralize, alkalize and ionize water, then it is energized further with Far Infrared technology. This produces a very healthful pure water to drink when the water may otherwise be acidic or too "soft". It is recommended that our Corrected Water re-mineralizing alkalizing oxidation ionizer unit be utilized with reverse osmosis systems, and on any water that is lower than ph 7. A natural re-mineralizing alkalizing ionizer cartridge can be added to either an under counter or a countertop unit for correcting the water when needed. It contains naturally occurring, crushed and screened white marble, calcium carbonate medium. It is used to neutralize acidic or low pH waters to a neutral, less corrosive effluent. As the purified water passes through the Corrected Water cartridge, it adds back ionized calcium, magnesium and potassium carbonate ions. Reverse osmosis tends to lower the pH of water by removing alkaline minerals. Our re-mineralizing alkalizing ionizer will help correct that problem and raise the pH back. One of the most important benefits of alkaline water is that it lowers Oxidation Reduction Potential (ORP). This means less damaging free radicals in the water. The re-mineralizing alkalizing ionizer turns acidic or soft water into an excellent, natural, slightly alkaline mineral ionized water, activated and energized, like you would find at certain "healing springs" in several parts of the world. The water resulting from one of our Corrected Water cartridges is an ideal way to counter acidic water for improved functionality in the body. With slightly alkaline water with a low surface tension and far infrared frequencies, the water performs better in the body doing all that water does for you. These units are much superior to the highly promoted expensive alkalizing devices developed in Asia, which generally raise the pH too high. Some of these use a chemical solution, and they do not promote long term good health. Too much alkalinity contributes to ill health just as readily as an overly acidic condition. Our specially corrected water also serves as a better carrier and penetrates membranes more readily. Nutrients and oxygen are delivered better, and toxins are removed from cells more thoroughly. Drinking plenty of pure water promotes better health and vitality. We have the units that produce the water you want to drink. The re-mineralizing alkalizing ionizer will be beneficial for incoming water up to a ph in the low 7's. When either the source water or purified water has a pH of 7 or less, this "Corrected Water" is definitely the way to go. If you are not sure if your water is low enough in pH for you to benefit from the corrected water cartridge, you can test your water with pH tape or strips (litmus paper) or another method to determine if it is needed to correct the water. There is a choice of either a sealed self-contained unit with connectors, primarily for reverse osmosis systems, OR an add-on housing with a replaceable cartridge for cartridge filter systems. 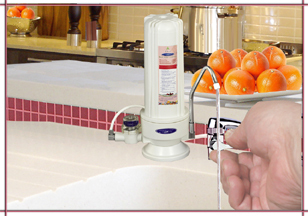 A Corrected Water unit can be used with either countertop or under counter purifier systems. (See below.) Either way, allow for the extra space needed. NOTE: A pair of base clips as shown in the left photo, or a pair of double clips to attach this cartridge to another, are available to order as an add-on further below. This unit may be added to most types and brands of water treatment systems if you already have one, either countertop or under counter. 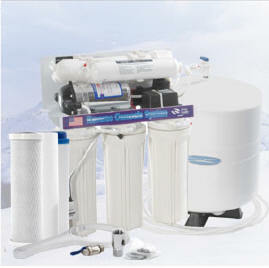 NOTE: A re-mineralizing akalizer unit may be added to many brands of water filter systems. • In stage 1, Water flows through a one-micron pre filter pad (1 micron equals 1/25,000th of an inch), which removes suspended particles such as silt, sediment, cysts (Giardia, Cryptosporidium), sand, rust, dirt, and other un-dissolved matter. • In stages 2 and 3, Water travels through a special media blend of natural mineral carbonates to alkalize/ionize and re-mineralize the water and raise the pH level. Corrected Water reduces acidity in the body by adding natural calcium, magnesium and potassium ions to the water that can be absorbed well in the human body. 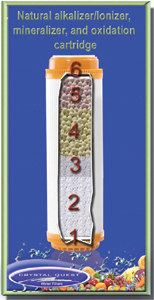 • In stages 4 and 5, Water travels through special bed of natural infrared and mineral balls. Infrared rays are the invisible portion of the sunlight spectrum. Far-infrared has been found to promote growth and health in living cells of plants, animals, and humans. Recent studies in the biotechnology field have revealed that the far-infrared rays played an important role in the formation and growth of all living organisms. For this reason, these specific far-infrared rays are called "biogenetic rays". There is an enrichment of water treated with a water purification system that has far infrared. The infrared and mineral balls in Corrected Water cartridges improve water so it is better able to penetrate and activate cells, strengthening various organs within our bodies. The far infrared rays are applied using a synthetic UV-C emitter into flat ceramic media with minerals, then run through a heated mold that shapes the material into balls. The process is proprietary. The ceramic mineral balls hold the infrared energy and gradually emit the waves into the water passing through the balls. Water and proteins are the integral parts of all living organisms on Earth. Water molecules are always oscillating. If water molecules are exposed to oscillating action of 8-10 micron wavelength (same as the wavelength of water molecular oscillation), the "resonance" occurs between the two oscillations. Infrared causes resonance between water molecules. It ionizes and activates water in our cells and blood, thus improving our circulation, cellular metabolism and overall health condition. The resonance causes ionization of water into hydrogen ions and hydroxide ions at extremely high speed (10/12 sec). This ionization is called "water activation." If such activated water enters human cells, the nutrition and metabolism of cells and the excretion of residues from cells are enhanced. Water makes up 70% of the mass of the human body. The water conditioned by the infrared and mineral balls, vibrating at a frequency similar to that of the human body, is able to revitalize, reactivate, develop and strengthen various organs in the body when it is absorbed. Infrared rays are thought to help in strengthening the micro-circulatory system. This system delivers oxygen and nourishment to the various organs. Some people may notice a reduction in the discomforts of ailments that have plagued their body for years. Elevation of the immunity against diseases is another benefit of Infrared frequencies. They also help to slow down the aging process, improve resistance against degenerative diseases and increase longevity. There is no age limit for using this product. It can be used from the day you are born until very old age. There are no side effects of exposure to infrared. The real effects can be measured in improved stamina, health and overall good living. • In stage 6, Water flows through another one-micron filter pad (1 micron equals 1/25,000th of an inch), for further removal of suspended particles and other un-dissolved matter. 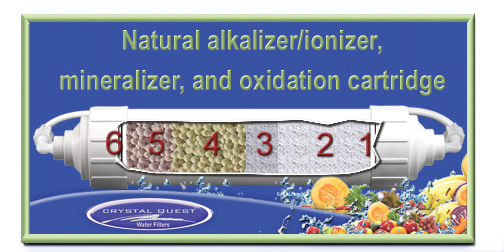 CRYSTAL QUEST® natural re-mineralizing alkalizer/ionizer, acid neutralizer and oxidation process is effective and affordable. It turns water into naturally alkalized calcium ionized water. to include a pair of base clips ("feet" as shown in the left photo above), total $76. to include a pair of double clips (to attach this cartridge to another), total 76. 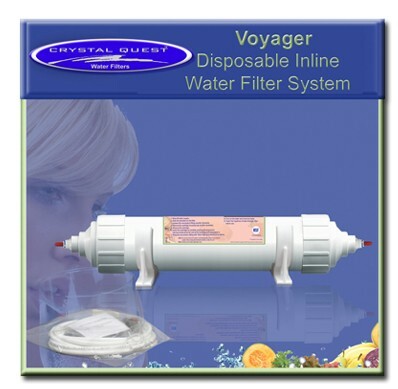 NOTE: This unit may be added to many brands of water filter systems, especially if the housing is similar. Use especially when the result water has a pH of 7 or below. NOTE: This cartridge requires an existing housing in which to be inserted. 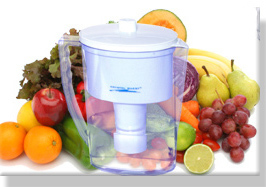 NOTE: CLICK HERE for regular pure water pitcher cartridge and fluoride removal cartridge.